Until recently, Coinbase Pro operated under the name GDAX, but it has a very long history of heading the world of cryptocurrency exchanges. As the name indicates, Coinbase Pro is another version of Coinbase, but it comes with features that are more suited to professional and advanced traders such as more detailed graphs, charts and trading options. Coinbase Pro has gained a lot of popularity and prides itself on being the most trusted exchange created for trading cryptocurrency. It is backed by a well-established and large company that also offers insurance for their Coinbase USD Wallet. FDIC Insurance provides this insurance worth $250,000 and it is also registered as a Money Services Business with FinCEN. As mentioned above, Coinbase Pro has been designed for professional traders, but this doesn’t mean that the advanced platform is not as reputable as the standard Coinbase exchange. Founded in 2012, Coinbase is not just a digital currency wallet. It is also a platform for merchants and consumers for making transactions involving the then-new digital currencies such as Bitcoin, Ethereum and Litecoin. Based in San Francisco, California, the platform is used by more than 20 million users and more than $150 million have been traded on Coinbase. As highlighted by the name, Coinbase Pro has been developed to appeal to advanced and professional traders who are interested in knowing more than the basics of cryptocurrencies and their market fluctuations. There are trade histories, real-time orderbooks as well as charting tools. 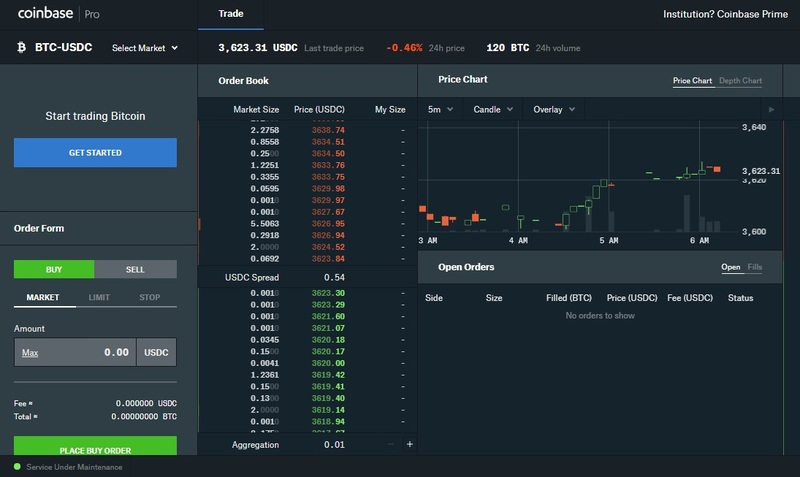 At the same time, the highly intuitive interface on Coinbase Pro also adds to its value and makes it possible for traders to start using the exchange right away to fulfill their trading goals. The platform is designed for individual traders and not suited for institutions. The only requirement that you have to fulfill is to be in one of the geographical areas that are supported by Coinbase Pro. If you are, you can sign up for an account on the exchange. In case you already have an account on Coinbase, you can simply choose to upgrade it to Coinbase Pro. People who are located in Australia, Singapore and Canada can use Coinbase Pro for accessing cryptocurrencies, but will not have any access to fiat. Traders who are based in Europe, UK and the US will be able to access fiat currencies as well. Hawaii and Wyoming are the only two exceptions as Coinbase Pro is not licensed in these areas as yet. The European countries where you can open an account on this exchange are Slovenia, Norway, Sweden, Ireland, Italy, Netherlands, France, Spain, Portugal, Bulgaria, Monaco, San Marino, Slovakia, Belgium, Poland, Malta, Hungary, Liechtenstein, Croatia, Denmark, Greece, Austria, Switzerland, the Czech Republic, Finland, Latvia and Cyprus. Since Coinbase Pro has not been designed to cater to institutional clients, a separate platform has been developed for these groups and is called Coinbase Prime. It has been created for institutional investors, but it provides access to all Coinbase products along with the diversified liquidity pool. The exchange also comes with a dedicated team, which includes institutional coverage professionals based in New York City. Coinbase Custody is another option as this provides institutions with custody of digital assets and it includes secure storage and strict financial controls. The availability of the cryptocurrency trading pairs purely depends on the local regulations of a country. Users of Coinbase Pro have the option of viewing the orderbook and other information pertaining to any cryptocurrency pair, but they can only trade ones that comply with the regulations in your country. In Singapore, Australia and Canada, the trading pairs that are available include BCH/BTC, LTC/BTC and ETH/BTC. People who are based in the UK can get access to cryptocurrency pairs such as BTC/EUR, ETH/EUR, BTC/GBP, ETH/BTC, BCH/BTC, BCH/EUR and LTC/EUR. Traders based in Europe have access to the same cryptocurrency pairs and there is only one exception in the form of BTC/GBP. As for people who are based in the United States, they will be able to trade crypto pairs including BCH/USD, BCH/BTC, LTC/USD, LTC/BTC, ETH/USD, ETH/BTC and BTC/USD. In order to use your account on Coinbase Pro, you will need to verify it and this is done before you begin your trading and deposit the funds in your account. The verification process needs to be completed before you can use your account on Coinbase Pro and this can be done by uploading an official document. A driver’s license or state ID has to be uploaded by customers in the United States. You also need to provide your residential address to Coinbase Pro and also the last four digits of your Social Security Number. A government ID document, driver’s license or passport should be uploaded by UK residents and they also have to answer verification questions as per their national identity databases. As for traders from other countries, they have to upload two identification documents such as national ID cards, passports and driver’s licenses. There is a dropdown menu on the top left corner of the page from where you choose the cryptocurrency pair you want to see or trade. You can check out all the crypto pairs available or narrow down your options by markets. They are divided into markets by GBP, EUR, USD and BTC. Directly to the right and in the top middle of the page, you will be able to see up-to-date information about the crypto pair you have selected. This includes the last trading price, the 24-hour trade volume and the percent change in price in the last 24 hours. You need to sign up if you haven’t already or log into your account and you will be able to find the buy and sell order firms. The orderbook is on the right and there is also the choice of viewing the trade history. There are columns in the orderbook for price, market size and ‘My Size’ and sell orders are listed on top with buy orders below. The trade history is outlined in chronological order and every trade is color-coded for indicating buy or sell. There are columns for the price, trade size and time, right down to the second. The price chart is on the screen’s right side and takes up over half the page’s width. You can change this price chart into the depth chart on the right, if you prefer to do so. The depth chart shows you the buy and sell depths in line charts and the middle indicates the mid-market price. You can find the specific price, the amount you can purchase or sell at that point and the total price in the original currency by hovering over at any point. On the top right corner, you can select the price chart, which will show you the low, high, close, open and volume values for any point that you wish. Hovering over a point will also show you the specific price on the vertical axis and specific time on the horizontal axis. A candlestick chart is the default chart type, but it can be changed to a line chart if you want. The candlestick chart is color coded orange/red and green for sell and buy. Directly on the right side above the chart, the type chart can be changed as well as the intervals. The default option is five minutes, but other options include 15 minutes, one minute, six hours, one hour and even one day. When you want to deposit digital currency into your Coinbase Pro account, you should go to the ‘Assets’ section and click on ‘Deposit’. The next step is to select the type of currency you want to deposit and provide a wallet address where you want the coins to be sent. Similarly, withdrawing currency is easy with Coinbase Pro. Under ‘Assets’ you will also find the option of ‘Withdrawal’. Again, you have to select the currency type and then enter the wallet where you w ant the currency to be sent. You have to use the ‘Assets’ page for depositing and withdrawing fiat currency and this is also done through the ‘Deposit’ and ‘Withdrawal’ option. When using US dollars, you can bank wire from an American bank account or do an ACH transfer and the same options are available in the case of withdrawals. You can use SEPA transfers for making deposits and withdrawals using Euros. When it comes to UK customers, they also have to use SEPA transfers for funding their Coinbase Pro account with Euro. In this case, a conversion fee might be charged by the bank. Traders also have the choice of making instant transfer funds between the Coinbase and Coinbase Pro account. This is completely free of charge and is also done from the ‘Assets’ page. You just need to select the relevant Coinbase or Coinbase Pro wallet in the recipient’s section. The maker-taker model is used by Coinbase Pro for charging its fee and no fee has to be made by maker traders at all. Makers are the people who place an order, but they are not immediately filled by being matched to an existing order. In contrast, taker orders are the ones that are filled at once and they are done at market price. When you are checking out the fee structure at Coinbase Pro, you should remember that you can divide an order into multiple ones and these include a maker order and a trader order. In such situations, appropriate fees is charged for every separate order and this means the maker portion does not have any fee. As far as taker fees is concerned, it can be reduced with the help of volume based discounts and can go as low as 0.10 percent. The starting point for taker order fees is 0.30 percent for volumes that are higher than $10 million. The fee drops to a level of 0.20 percent between $10 million and $100 million. The 0.10 trading fee is applicable for trading volumes of more than $100 million. The trading volume is based in USD and is for a period of 30 days. Transactions that are made on the books in a different currency are first converted to USD and then the volume calculation is done. The security of funds is ensured at Coinbase Pro because it offers insurance protection to its clients. All the digital assets that are stored online on the platform have complete insurance. According to Coinbase Pro, 98 percent of the digital currency of the customers is put into cold storage. Furthermore, all the US dollars in accounts are covered by FDIC insurance and the maximum coverage that’s available for every customer is $250,000. The industry-leading API is part of the Coinbase Pro platform and it boasts a WebSocket feed, which makes it incredibly simple for people to get real-time market data. At the same time, users can develop secure and programmatic trading bots with the help of the trading API. You can find a page dedicated to the trading API on Coinbase Pro along with related documentation. This can be accessed from the bottom of any page on the website of Coinbase Pro or the main navigation menu located at the top of the page. Coinbase Pro is the new game given to the popular GDAX exchange, which is the professional version of the top-ranked crypto exchange and is designed for advanced traders. The platform is well-designed and intuitive and offers all the tools and charts that professionals traders require during the course of their activities. Another advantage that traders appreciate is that the fees is very low and market makers don’t have to pay any fee at all. Other than that, Coinbase Pro is also the most trustworthy crypto exchange at the moment because it has excellent security measures in place which keep customer funds completely safe and secure. It also has reliable customer support and you can get the answers you seek and move ahead with your trading.